This resource provides over 70 ready-to-use informal diagnostic tests and other evaluative aids to help reading specialists and classroom teachers identify students' individual reading problems in order to prescribe effective corrective or remedial instructions. These diagnostic aids cover the basic skill areas of phonic analysis, structural analysis, and comprehension at primary and intermediate levels, as well as survival reading skills at the intermediate and upper levels. 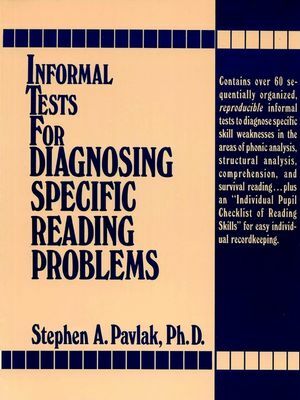 Stephen A. Pavlak, Ph.D., has taught and supervised reading on both the elementary and secondary levels. As a reading supervisor, he organized a complete diagnostic and remedial reading program in his own school district. Since 1971, Dr. Pavlak has been on the faculty of the California University of Pennsylvania, where he presently serves as a chairperson of the Elementary Education Department and teaches in the Reading Program. He also serves as a consultant to public and private schools on the development of reading programs and has participated in many reading and language arts programs on the local, state, and national levels. Dr. Pavlak earned his M.Ed. degrees in Elementary Education and Reading from the California University and his Ph.D. with a major in Reading from the University of Pittsburgh. About This Book of Diagnostic Reading Aids. Section 1: Informal Reading Inventories. Informal Survival Reading Skills Inventories. Section 2: Individual Pupil Checklist of Reading Skills. Individual Pupil Checklist of Reading Skills. Interest Inventory (Primary Grade Level)-- Oral or Written Form. Interest Inventory (Intermediate Grade Level) -- Written Form. Incomplete Sentences Test (Primary Grade Level). Incomplete Sentences Test (Intermediate Grade Level).